WHS student Matthew Manson holding his coveted Outstanding Citizen Award from Buckeye Boys State. Matthew Manson with his newfound friend Nick Conner of Toledo at Buckeye Boys State. Even after arriving there, incoming Wauseon High School senior Matthew Manson wasn’t entirely sold on Buckeye Boys State. “The first two days were rough. We had a lot of meetings about the election process and policies, and it wasn’t fun,” he said. 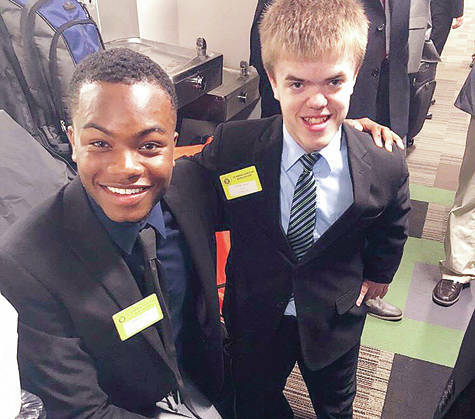 Standing four feet, two inches tall, the 17-year-old also worried how his small stature might be perceived by other participants. The annual Buckeye Boys State, sponsored by the American Legion Department of Ohio, took place June 10-17 at Miami University in Oxford, Ohio. Manson was one of three Fulton County high school students nominated by the Wauseon American Legion to attend. He had no prior knowledge of the event, but after learning of it he decided the experience might be good. Nominated by Fred Collar, his high school government teacher, and with his paperwork expedited by retired Fulton County Judge James Barber, Manson soon found his niche among the 1,225 high school students who attended BBS from across the state. What he initially considered a dreary experience perked up for Manson on the third day. A member of BBS’s fictional Federalist political party, he decided to run for municipal court judge against his charismatic roommate within his group’s equally fictional City of Voisard and McQuigg County. He credits his slogan, “I’m 4-2 with an attitude you can’t refuse,” and his speech before his constituents, for his win among about 100 voters. But first he had to pass a mock bar exam similar to those taken by prospective attorneys. Manson said the third time was the charm. And while he kept his campaign light and non-aggressive, he was surprised by the fervor of candidates for other positions. “There were already kids who (had) prepared for years for campaigning for governor the first day,” he said. For the next four days, Manson conducted his judicial duties in a mock courtroom he set up in a university dormitory room. He was given a handbook spelling out basic Ohio law, and dealt with mock cases that included traffic citations and lawsuits. One involved a perpetrator fleeing from police. Another considered a violation of the Fourth Amendment. And a third brought on a class action lawsuit against people who had not paid county recorder fees. The court sessions lasted from 9 a.m. to 3 p.m. each day. Manson also attended immitation bar association meetings where he met actual judges and Ohio State Bar Association President Randall Comer. Evenings were reserved for attending arena assemblies with all of the BSS participants. As for his size, he quickly discovered there was no cause for concern. Some of the friends he made at BBS have begun a group phone chat, and plan to meet for a trip to Bowling Green State University in the future. The Wauseon High School basketball team manager, baseball manager and announcer, and 4-H member said he came away from Buckeye Boys State a changed person. “It kind of showed me that there are good people in this world who accept each other for what they are, and do not despise you for your differences,” he said. 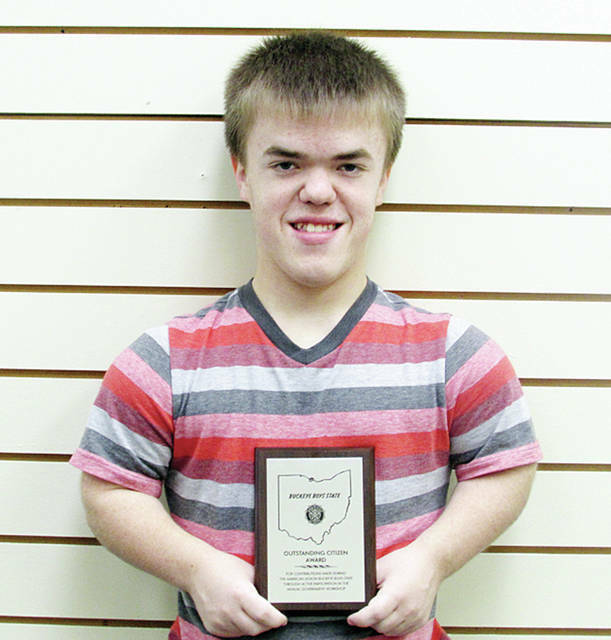 https://www.fcnews.org/wp-content/uploads/sites/45/2018/06/web1_matthew-manson.jpgWHS student Matthew Manson holding his coveted Outstanding Citizen Award from Buckeye Boys State. 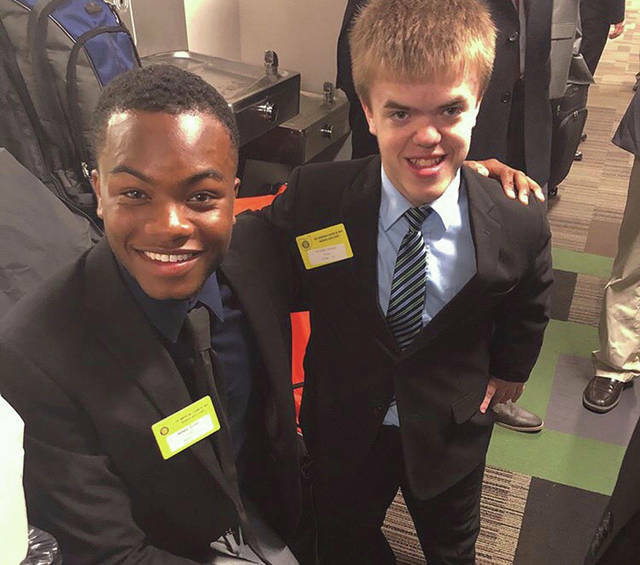 https://www.fcnews.org/wp-content/uploads/sites/45/2018/06/web1_Mansor.jpgMatthew Manson with his newfound friend Nick Conner of Toledo at Buckeye Boys State.